Source: When Are YOU Better? Please shop my VIDA Signature collection of men’s and women’s scarves and women’s tops to help me become a Slate artist by selling 10 pieces. Also, customers who buy my 1st 10 pieces will each receive a $25.00 USD VIDA gift card. Categories: Uncategorized | Tags: apparel, Maxine Billings, men's scarves, shop VIDA, shop VIDA discounts, shop VIDA gift cards, shop VIDA Signature collection, women's scarves, women's tops | Permalink. Hello again! This time, I’d like to introduce you to some of my wall decor on Zazzle. The photos are also from my Nature’s Finest art gallery. I have created these designs on Zazzle so that you can order them as is. However, if there is a print you would like but don’t see, please feel free to let me know so that I can add it to my Zazzle collection. Also, please keep in mind that you still have the option of customizing your own designs from my Nature’s Finest website. Just contact me and let me know what you want. Categories: Uncategorized | Tags: azaleas, calla lily, canvas art print, flowers, magnolias, Maxine Billings, mountains, natural creation, nature art, nature art prints, nature photography prints, nature photos, Nature's Finest, Nature's Finest by Maxine Billings, wall art, wall clock, wall decor, wood panel art, wood wall art | Permalink. Hello, everyone! For those of you who haven’t seen them, I’d like to introduce you to my new Zazzle Greeting Cards Collection. So far, I have a total of ten cards, but I’ll be adding more. All of the photos are from my Nature’s Finest art gallery. Please take a few minutes to visit my Zazzle store where you’ll find a selection of various items I’ve created just for you. Categories: Uncategorized | Tags: azaleas, best wishes, care and concern, congratulations, dandelion fluff, flowering trees, flowers, get well, greeting cards, Maxines Natures Finest Zazzle Store, natural creation, nature art, nature art prints, nature photography prints, nature photos, Nature's Finest, Nature's Finest by Maxine Billings, rhododrendons, roses, sympathy, thank you, thinking of you, trees | Permalink. Hello, everyone! I’ve added another book contest to the other three that I’m currently hosting. 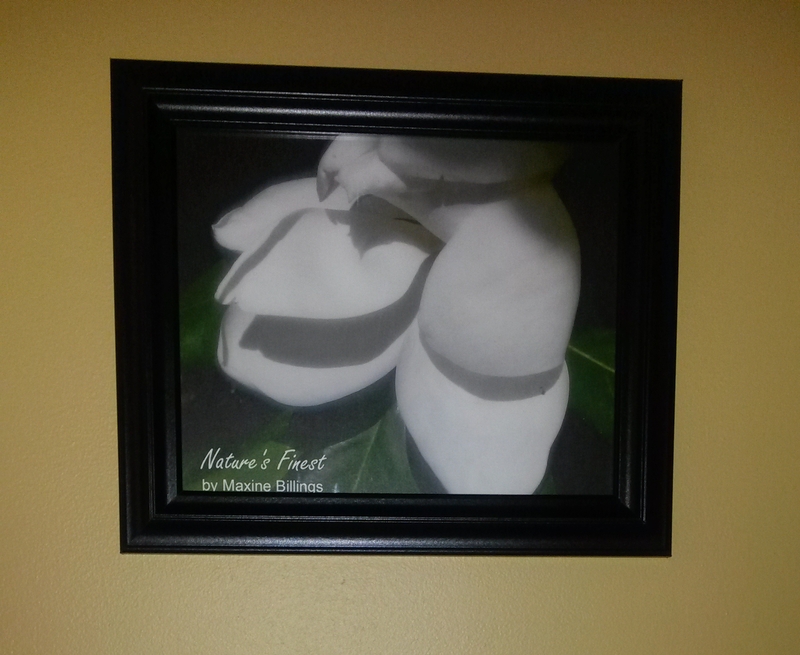 This one is called “Guess Who.” The first person to correctly answer the following question will win this beautiful, framed, 8×10, matte-finish print (a value of approximately $15.00) from my Nature’s Finest “Magnolia” collection. QUESTION: One of my characters from my book “TIME FOR HOPE” makes a recurring role in my book “IN SICKNESS AND IN HEALTH.” What is this character’s first and last name? Well, there you have it. I’ll also post a link for this contest on the BOOKS page of my main website along with the other three contests. Now, go READ, PLAY, and WIN! August: Painting For a Purpose: Heart Walk Fundraiser.